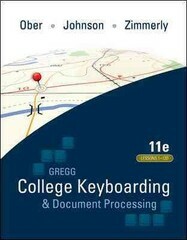 Gregg College Keyboarding & Document Processing Kit 3: (Lessons 1-120) w/ Word 2013 Manual 11 Edition Gregg College Keyboarding and Document Processing (GDP), 11e by Ober, Johnson, and Zimmerly: Your complete learning/teaching system. Your guide to success. GDP/11 is an integrated keyboarding system designed to process and score documents created in Microsoft Word. Together, the book and software systematically lead students through each lesson to provide an easy path to success. As a solid product for over 50 years, this version of the GDP software has grown into an online functionality. The same program is now web-based with seamless updates to provide greater accessibility for use at home, in class, and in labs - perfect for distance learning! Strong enhancements to the book while maintaining key elements including integrated language arts (starting at lesson 21) support the cohesive program's strong content. Skillbuilding is reinforced with MAP+ (Misstroke Analysis and Prescription). MAP+ is an individualized, diagnostic tool that is built into the software to help identify student's strengths and weaknesses while providing prescriptive drills to help them practice where they need it most. Also, MAP+ now has new, unlimited drill lines that begin at Lesson 1. Additionally, GDP/11 automatically scores for keyboarding errors and now formatting errors too! As a result, instructors will appreciate the customization of course management tools in GDP/11, including the new GPS (Grade Posting System) which allows complete flexibility in setting up grades. GDP/11 your complete learning/teaching system. Your guide to success.